Cabbage Patch Kids were the dolls of the ‘80s. It is probably the equivalent of the Baby Alive of today. Many parents now (and probably some of their older kids) remember playing with these adorable, yarn-haired dolls. You can adopt them and provide them clothes and accessories to your heart’s content. 1 Pink Smocked Dress Feel like your back in the ‘80s with this pink smocked dress. 2 Pink Mary Jane Shoes Pair your pretty dress with an adorable pair of pink Mary Janes. 3 Yarn Hair Wig A Cabbage Patch Kid needs to have yarn-made hair so wear a wig. 4 Face Paint Use face paint to create the exaggerated cute look of a doll. 5 Cabbage Patch Kid Doll Partner up with a Cabbage Patch Kid doll for maximum effect. 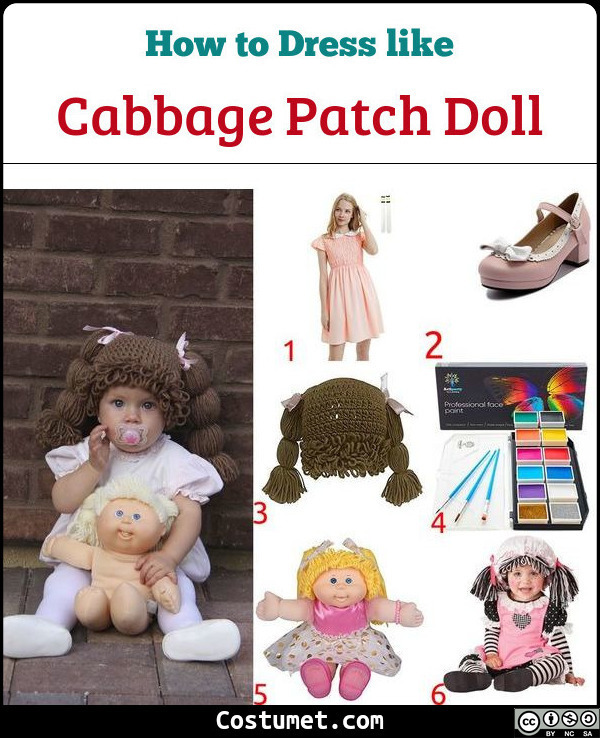 6 Infants Costume Set Transform your baby to an adorable Cabbage Patch Kid doll costume set. Cabbage Patch Kids was created by Xavier Roberts back in 1976. Then 21-years-old, Roberts started making soft-sculpture dolls as a project for his Art class.